Life is rife with challenges and struggles. Sometimes we begin with one ambition, but in due course of time we may change our path owing to unavoidable circumstances. This has occurred often with professional careers, where walking a trodden path has given way to a passion stifled by external pressures. Antonio Lobo is one such person who astutely switched careers. He is an example to all those floundering in incompatible jobs. Never an academically brilliant student, Antonio or Anthony, as his friends know him, always had an inclination towards working with computers. Even if he did not perform well in the conventional subjects, he always outshone the others when it came to computers. His friends could always rely on him to rescue their computers from a dire situation. He is the type who can be engrossed in computer repairs for hours. However, his mind was fixated on following in his father’s footsteps and he enrolled as a BBA (Bachelor of Business Administration) student. Anthony went off to Mumbai for a training course. Of the 150 students in his batch, only thirty, including Anthony, are competent enough to try their hand at chip level repairing. This points to the value of intelligence over pure book knowledge, which condemns many products of the engineering institutes to vapidity in terms of intellectual improvisation. ‘We are taught the theory that goes into the construction and repair of the motherboard but in reality one faulty IC can demolish your textbook theories. Trying to figure out the problem is a tedious task that can take hours. It is a bit like reverse engineering,’ says Anthony. 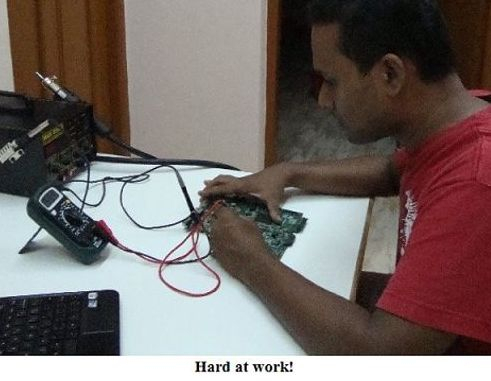 He continues, ‘People try their hand at it but eventually give up the job because of the difficulty level. I’ve been in this profession for three and a half years. Initially, I too had trouble, but I enjoy learning. Learning and gaining experience has helped me. I have not damaged anybody’s laptop up till now. There are so many who end up damaging people’s laptops.’ He does not profess perfection but he belongs to the ilk of those able to manipulate knowledge to use it with the maximum advantage. He is still in the process of gleaning information and augmenting his expertise by attending institutes in Gujarat, Andhra Pradesh and Karnataka. The training was a breeze compared to the problems he faced in setting up shop. He encountered dealers of spare parts who swindled him and he suffered a loss. Obtaining a shop in Margao was an expensive proposition. The costs went into lakhs of rupees. ‘A ground floor flat could cost up to forty lakhs when I started,’ says Anthony. He had the challenge of established laptop repairers as competition and in addition to that he ended up in a locality that is hidden away from the main market. His education as a BBA graduate has facilitated his laptop repair business and he has no regrets he pursued the course before he entered this sphere. He put his education to good use to keep his business afloat when he did not have enough money. He used Facebook and Google for free advertisement and built a good reputation by toiling away. 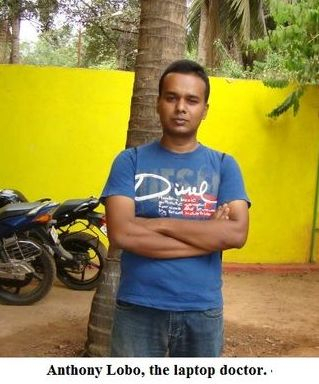 Anthony tells us, ‘Because of BBA I knew which people to target and have reached people even farther than Margao. I have people coming from Bicholim, Pernem and Sanguem. He persevered through it all and finally made a success of it and today earns at least four times what he earned as a stockbroker. Most people approach him to have their screens, keyboards or motherboards replaced. Seventy per cent come for chip level repairs because this service is not easily available. Where most laptop servicing companies immediately suggest replacing the motherboard instead of investigating the problem, Anthony’s work involves intricate testing, finding the source of the trouble, and rectifying it. Thus, the customer is spared the huge amount of money he or she might have had to spend on a new motherboard. Anthony’s service is quick, taking three or four days where other would take a fortnight at the earliest. And his rates are very reasonable too. Motherboard repairs start from Rs 1500 to 3000, testing is just Rs 300 and spare parts such as a keyboard would cost a customer Rs 1200. The oldest model he has repaired is a Centrino. He avoids older models because repairing becomes more laborious. Some of the old models have about sixty to seventy screws holding them together and too many components as compared to the more compact newer models. Ever grateful to his mother, who supported him, encouraged his interest in computers and suggested the name Laptop Doctor, Anthony feels all the ups and downs he has had have all been worth the journey to arrive at the position he is in today.